In the early 19th century, as settlers continued moving west towards Indiana, Perry Township and the town of Southport began to form in southern Marion County. Named after Commodore Oliver Hazard Perry, a War of 1812 hero, Perry Township was laid out in 1822 by county commissioners before becoming an independent township in 1824. One of the first to settle in the area, Jacob Smock farmed land near the "pioneer town," which later came to be known as Southport. The town was formally established in 1832—around the same time two notable pioneer settlers, Samuel and Mary Bryan, made the area their home. In 1853, Southport became the first community in the township to be incorporated, and a century later, Southport was one of the only communities in Marion County to remain its own city apart from Indianapolis. 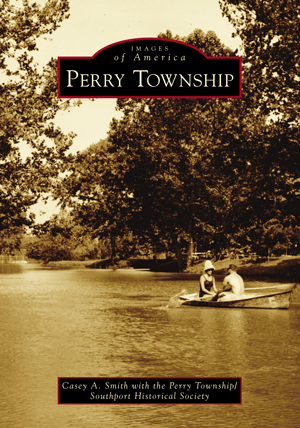 In Perry Township, author Casey A. Smith and members of the Perry Township/Southport Historical Society explore some of the city's current and former highlights. Smith, a journalist and lifelong Perry Township resident, attended Southport High School and graduated with degrees in journalism and anthropology from Ball State University. The Perry Township/Southport Historical Society consists of longtime Southsiders who have spent decades preserving the town's history.